Patients will be seen by vascular surgeons and interventional radiologists specially qualified in diagnosing and treating problems with arteries and veins. Patients will need to be seen by the doctor and sent for a scan to identify the problem arteries that may need treatment. Magnetic resonance imaging (MRI) scan, CT or ultrasound scans can be used to show exactly where the diseased artery is and if it can be treated by a minimally invasive procedure. Procedures used to treat or access blood vessels come under the heading 'Vascular Intervention'. Special X-ray dye called 'contrast' is used to give very detailed views of blood vessels throughout the body. Access into the blood vessel is usually through a small nick in the skin and a small plastic tube (called a 'sheath') is then placed and allows the interventional radiologist (IR) to work inside the blood vessel using even smaller plastic tubes, called 'catheters'. Using ultrasound and X-ray guidance the interventional radiologist can identify and treat narrowed or blocked arteries or veins. Interventional radiologists can also place catheters into blood vessels to allow long-term access for chemotherapy or dialysis, so patients don't have to have needles placed repeatedly during their treatment. Angioplasty involves stretching narrowed or blocked arteries with a special balloon catheter. After making the artery numb using local anaesthetic a small plastic sheath is placed in the artery, usually in the groin. X-ray dye or contrast is used to show the narrowed artery and then a balloon is inflated to stretch the artery open, most commonly arteries in the pelvis or legs. Stretching the artery is often enough to improve symptoms caused by narrowed arteries, such as calf cramp when walking a short distance. Sometimes a special balloon coated with a drug or a stent are used to try and stop the artery norrowing down again. 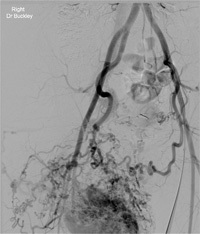 If the artery narrows again with time it can often be treated with a repeat angioplasty or stent. A stent is a very special metal tube that is placed into the artery to keepthe artery open. Some stents have a medical drug to stop the artery closing the stent down. Vascular access procedures provide long-term access to blood vessels for chemotherapy or dialysis. A Port-a-cath ('Portacath') is a special chamber that is placed under the skin on the chest wall with a tube running into the big veins in the chest. This allows specialist nurses and doctors to access the 'Port' using special needles, and inject drugs that might injure smaller veins in the arm, but which are very unlikely to injure the bigger veins in the chest. Because the catheter is placed under the skin it reduces any risk of infection. 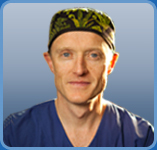 An Interventional Radiologist (IR) can place put a Portacath in under X-ray guidance using local anaesthetic and light sedation. A tunnelled dialysis catheter is a special catheter for patients who require dialysis. It is placed on the upper chest wall and tunnelled under the skin and into the big veins in the chest. This allows for high blood flow rates required on dialysis. It can last for several years but is usually only needed for a number of months while surgical vascular access is maturing. This is a small plastic tube (catheter) placed in the arm and steered into the large vessels in the chest. This allows medications to be given over an extended period (several weeks to months) without having to re-puncture veins in the arm.